Loaded with refined toxic waste, the Incinerated Garbage Bath spews familiar looking toxic refuse that has been stripped of all its harmful chemicals, made biodegradable and heated to boiling point for extra purification! The ultimate way to recycle, reduce and reuse! The Incinerated Garbage Bath Skin can be used on the Heat Bath. The trap's stats (power, power bonus, attraction bonus, etc.) are not changed. The Incinerated Garbage Bath Skin can be crafted with the proper ingredients. The Incinerated Garbage Bath Skin can be traded on the Marketplace or through Give To Friends. 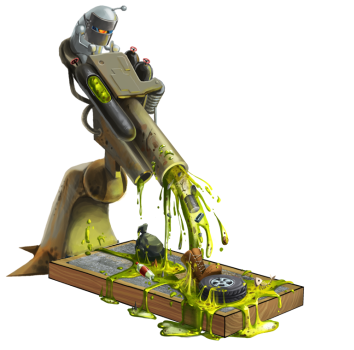 21 January 2014: The Incinerated Garbage Bath Skin was released with the release of the Toxic Spill content. This page was last edited on 9 December 2017, at 12:54.